The Sacred Banyan Tree is located on the divine soil of the Nithyananda Ashram, the headquarters of the Nithyananda global spiritual movement at Bidadi, near Bengaluru. It is also the “Bidadi Banyan Tree”, ‘Bidadi Kalpa Vriksha’. The Banyan Tree is a cosmic power house, an energy field by itself that has the power to manifest our true desires into reality. This energy field directly enriched by the physical presence of an Incarnation, creates a space for possibilities to open up within us. 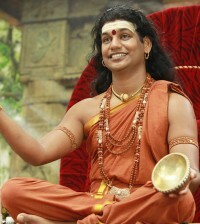 Paramahamsa Nithyananda saw the sacred Banyan tree in a divine vision on realizing His Incarnation’s mission on the planet. He spent months searching and upon finding it, established the ashram in January 2003 on the very sacred grounds where the banyan tree is rooted for ages. At once, He spotted it, and knew this Banyan Tree is the sacred cosmic hub from which His global Sanga will radiate the enlightened consciousness to the world, and beyond. Today, this sacred Banyan Tree is considered to be the guiding spirit of the Ashram, and the Sanga. The vast canopy umbrella of this ancient tree encloses a space resonant with spiritual energies. It is under this umbrella the majestic statue of Dakshinamurti resides, the first-ever Guru, the incarnation of Lord Shiva, imparting the deepest spiritual truths to His disciples in pure vibrating silence. Over the years, this sacred space has acquired a powerful reputation for healing, wish-fulfillment and awakening spiritual clarity, and draws visitors and seekers from around the world. The vibrations in this space are so distinct that even the casual visitor can feel its effects. The banyan tree is a ‘Kalpa Vat Vriksha’, a ‘Kalpataru’ in Sanskrit, meaning boon-giving tree that has manifested scores of sincere prayers into reality till date. At the base of the banyan tree is a cave-like hollow in which was found a ‘Swayambhu lingam’, naturally formed Shiva lingam, that represents the infinite light shaft form of Lord Shiva. This ‘Shiva Lingam’ has now been consecrated at the Sri Nithyanandeshwara Temple at the Bidadi ashram by the Master. The cave and the Swayambhu lingam have been here for centuries, worshipped by all neighboring, and distance people. The cave, and the Banyan Tree are witness to intense spiritual austerities of Enlightened Masters, and divine energies which radiate through the Master. The Jeeva Samadhi of the enlightened energies are present right below the cave, from which the tree mystically branches up, into this huge cosmic canopy. Jeeva Samadhi is the science where your body can be buried but you will be alive forever, even without your body you will be alive, forever. This is a power expressed by Enlightened Masters even after they decide to stop using their physical body, but continue to radiate their healing energies for enriching and blessing the world in a state of Samadhi, pure meditative state. Many temples, the sacred energy centers in India are actually built on the living presence of the Enlightened Beings for ages. Over a 1000 years, the banyan tree has grown and spread its foliage here. Impregnated with intense life-giving healing energy, this space heals at the physical, emotional and spiritual levels. It bears a direct mystical connection to Shambhala – the metaphysical space of Enlightened Masters. Here, one can find three holy trees: Athi (Fig), Ala (Banyan) and Arasa (Peepal – known to bear fruits without bearing flowers). In the Vedic tradition, these trees are sacred and are known as Vanaspati or ‘Lord of the forest’. It is said that Lord Shiva resides in the place where these three trees are found together. 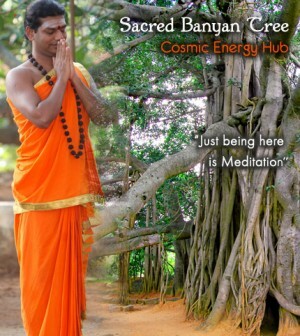 The sacred Banyan tree at the Master’s abode, is revered as a hub for cosmic energy. 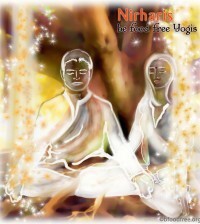 The Banyan tree meditation is like a life support system for us Niraharis. The Master Paramahamsa Nithyananda makes the Nirahara program participants and Niraharis visualize that we ourselves are the Bidadi Banyan – the wish fulfilling sacred tree. Our visualizations done in the Master’s physical/virtual presence is so intense that we can really feel the leaves, the breeze rustling through, the fruits, deep roots- lost in a state of absorbing prana directly from space. This visualization meditation is very effective in awakening the bio-memory of the tree that we carry in our bodies over several lifetimes. 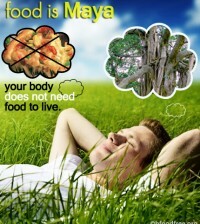 When this bio intelligence is awakened, the ability of the human body to live without food starts happening. The power of the Master’s initiation by touch ensures that the awakened intelligence becomes a part of our bio memories, and sealed and bolted permanently into us, every cell. All Niraharis are infact advised to remain in the visualization of the sacred banyan all day long. 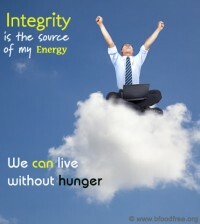 It really becomes a natural thing for us to do while going through daily life, performing all the required actions. Essentially through this Banyan Tree Meditation our bodies also become a vessel for cosmic energy just like the sacred Banyan.